The Basilica of Saint Patrick’s Old Cathedral is located in the Little Italy section of Manhattan between Prince and Houston Streets. Construction on the cathedral started in 1809 and was completed in 1815. 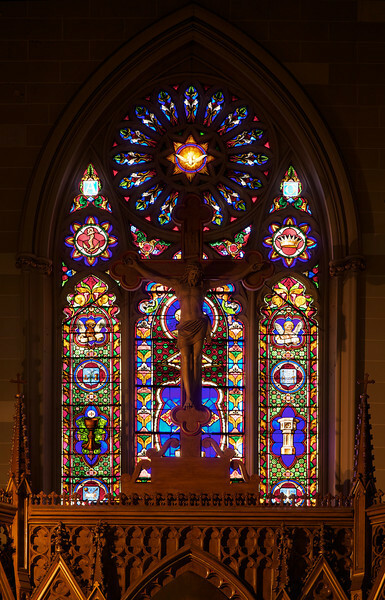 It was the second Catholic church in Manhattan and the third Catholic church in New York State, designed to meet the needs of the growing Catholic population in Manhattan. When competed, it was the largest Catholic church in the U. S., situated in the middle of farmland and country houses of the rich. Joseph-François Mangin was the architect of the Gothic Revival church; he also worked on the design of the New York City Hall. The cathedral is 120 by 80 feet with the inner vault measured at 85 feet high. Until 1879, the church was the seat of the Roman Catholic Archdiocese of New York, which was headed by the first Archbishop John Hughes from 1842-1864. Hughes was a pioneer during the waves of Catholic immigration during the 1840s by establishing Catholic outreach programs and building a tradition of charitable organizations in the U.S., according to the church website. Anti-Catholic rioting in the 1840s inspired by the Know Nothing Party threatened the cathedral. Hughes met the threat by arming the Irish organization Ancient Order of the Hibernians, positioning them on the walls surrounding the Cathedral. From New York City Architecture: “With the outbreak of the Civil War, President Lincoln invited Archbishop Hughes to represent America as his envoy to France, Spain and England, hoping to dissuade them from aiding and abetting the Southern Confederacy. Shortly after President Lincoln called for troops, the "Fighting 69th" Regiment, lead by Colonel Michael Corcoran, Thomas Francis Meagher and former Congressman, U.S. Attorney and Abolitionist - Captain John McKeon, headed off to what would be the Battle of Bull Run - and they were the only Union regiment that did not flee. The New York Irish Brigade, mainly men of the parish, fought heroically for the Union and the abolition slavery. Many of those soldiers lie in the cemeteries surrounding St. Patrick's. The cathedral was one of the first sites to be designated as New York City landmarks in 1966. The cathedral was designated a Basilica by Pope Benedict XVI in 2010. Currently, Italian-Americans and Dominicans make up a large part of the parishioners. The baptism scene from The Godfather was filmed at the church along with the scene in Godfather, Part III in which Michael Corleone is honored. A scene form Martin Scorsese’s film Mean Streets was in the cathedral’s graveyard. Sources: New York City Architecture, Saint Patrick’s Old Cathedral website, Wikipedia, NYCAGO.